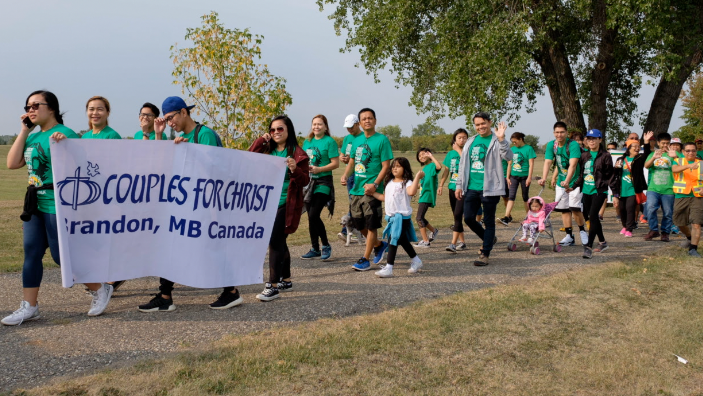 Couples for Christ Brandon held its 2nd ANCOP Walk last Saturday morning on August 18, 2018 at the Riverbank Discovery Centre Brandon Manitoba with a total of 105 registrants. The 2nd ANCOP Walk for Brandon experienced rain showers at the start of the program but was still a great weather allowing us the participants to walk and take part in this year’s ANCOP Walk 2018. The event started with an opening prayer by brother Ramil Campos, Brandon ANCOP Coordinator and CFC Brandon Unit Head. Then an opening remarks from brother Eli Minglana, Head of the ANCOP Winnipeg Chapter. CFC mission in helping the poor was cited by brother Roni Licsi, Head of Winnipeg West Chapter, and the program was concluded by brother Romy de Luna. CFC Brandon had the walk around the Riverbank Discovery area. The activity ended with fellowship and lunch at the park. The CFC Brandon Community is looking forward for next year’s walk. Where the group is hopeful to receive more sponsors, donors, and registrants not only from CFC members but also from different sectors and businesses here in Brandon which will help us raise funds for child education, community development and humanitarian relief. Thank you ANCOP and Couples for Christ Brandon, Winnipeg, and Neepawa for your never ending support and vision and for our incredible faith in action.